For those of you who really know me well, you know that ice cream is a staple in the Robinson household. Thanks to my dad, I developed a love for the good stuff. He would serve me a heaping bowl when I was just a little kid. Whenever I would scoop a bowl of ice cream for one of my friends, their eyes would go big as I scooped 4 or 5 scoops. I was always so confused when they said that was a lot of ice cream. To me that was normal. I always prefer something chocolaty. I hate Vanilla. I don't know why and it is very inconvenient so I wish I didn't... but i do. If I ever had a bowl of vanilla ice cream, I would cover it in chocolate sauce and stir it completely until there wasn't a trace of vanilla left. My favorite chocolate Ice cream is a very milky chocolate. The BYU Creamery has my favorite chocolate ice cream. I also like Blue Bunny and Tillamook a lot too. My all time favorite ice cream is Girl Scout Thin Mint cookie. I have been known to become very greedy when it comes to this ice cream. I do not like to share it since it is a limited flavor. In fact, when I had to go to the hospital during my freshman year of college to get my gallbladder removed, I was at Macey's buying this ice cream. Sadly to report, I never did get to eat that ice cream and it got thrown out at the end of the year. I almost cried when my roommates broke the news to me. I like my ice cream really really frozen. People who put their ice cream in the microwave for a few seconds to soften it are committing a crime. I also like to put a tiny bit of milk on the top because when the ice cream is so frozen, it freezes the milk a little and creates a delicious milky concoction. Ice cream tastes so much better when it is eaten out of the carton. I found these pictures that make me laugh every time. 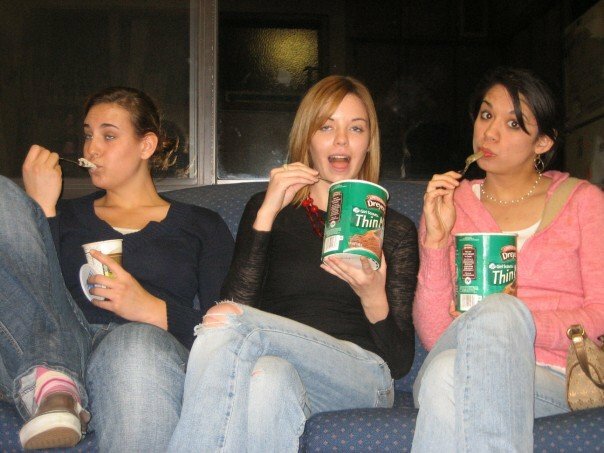 Freshman year: Me and Julie each with our own carton of the Thin Mint ice cream. This was pre-gallbladder attack. HAHA I cannot look at this picture without laughing so hard. Allison and I clearly weren't ready for this picture to be taken. It looks like there is a gas leak in our apartment because we look high. I do love ice cream. Haaa! I read the title of your blogpost and I hoped you would mention the Thin Mint icecream times. So funny! I won't let myself eat that icecream anymore, bad things happen...like eating the whole carton in one sitting.